‹ 안녕 Tids and Bits: International Edition! May sales and July’s distribution of the 1% local sales tax proved to be quite strong, rising 10.9% statewide to $35.8 million. For 11 months of fiscal year 2012 distributions are up 8.0% with one month to go. We do not expect these growth rates to continue at this pace given the flood of negative recent national economic news. Although we have to admit that Utah’s employment prospects thus far have shifted into third gear recently to more than 3% growth. 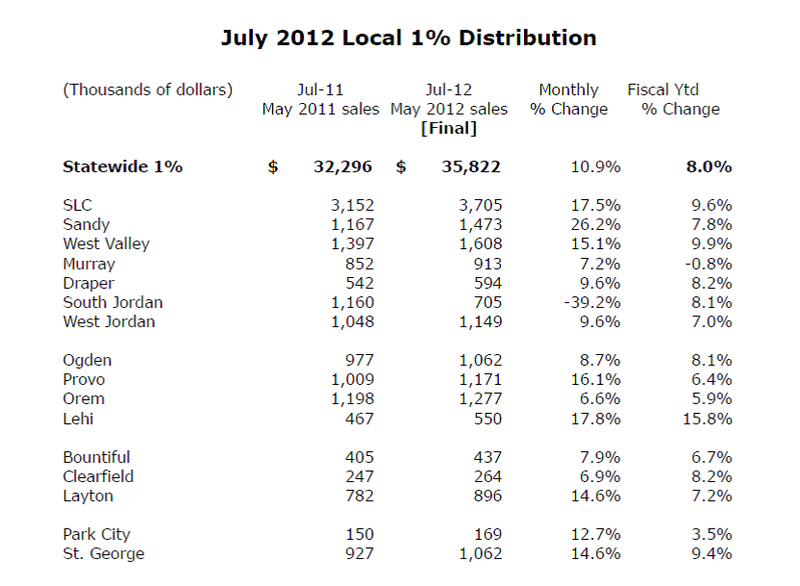 A host of cities saw their distributions rise more than 15% in July. The largest city in the state, Salt Lake City, received a 17.5% increase at $3.7 million. Its fiscal year to date gain is standing at 9.6%. Notable increases were seen in Sandy (26%), Lehi (18%) and Provo (16%). The Tax Commission instituted new 2011 population numbers to calculate the 50/50 formula in July’s distribution. Statewide the 2011 population rose to 2,817,222 from 2,763,885 in 2010, for an increase of 53,337 people (1.9%). We will attempt to calculate the future % impact on each city due to the new population numbers as soon as possible.